Interested in coverage solutions from NORCAL Mutual? Acting Secretary of HHS in 2017 declared a public health emergency to address what he called a “national opioid crisis.” It’s easy to see why. The number of people dying from opioid overdoses is increasing¹ and the economic burden is estimated at $78.5 billion a year in the U.S.² Furthermore, due to the increased scrutiny by law enforcement and regulatory agencies and the risk of dependency and overdose there are increased liability risks for physicians related to opioid prescribing. 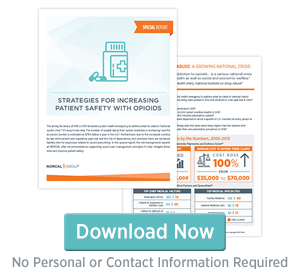 In this special report, the risk management experts at NORCAL offer recommendations supporting sound pain management principles for mitigating these risks and increasing patient safety with opioids. Careful prescribing and monitoring practices are essential to safely manage patients’ pain and increase defensibility in the event of a claim. Sound pain management and prescribing principles to help increase patient safety. The NORCAL Group of companies provide medical professional liability insurance, risk management solutions and provider wellness resources to physicians, healthcare extenders, medical groups, hospitals, community clinics, and allied healthcare facilities throughout the country. They share an A.M. Best “A” (Excellent) rating for their financial strength and stability. NORCAL Group includes NORCAL Mutual Insurance Company and its affiliated insurance companies. Please visit norcal-group.com/companies for more information.